This is me. Lady Leofwyn, wearing layered kirtles. There is so much wrong here. Kirtles are generally more form fitting, laced up the front or the back of the dress. These dresses were made in a hurry, taking less than a day or two to complete. The seams aren’t finished on either dress. But they were and still are works in progress. The orange-y brown dress has a stripe around the bottom of the skirt (to hide a rip that happened during the rush of creating a feast at an event), and the front now has lacing holes! All hand done! Go me! Only took me 3 or 4 years. The turban like head thingy is extremely useful. Keeps my hair out of my face and out of feast food! Very important. 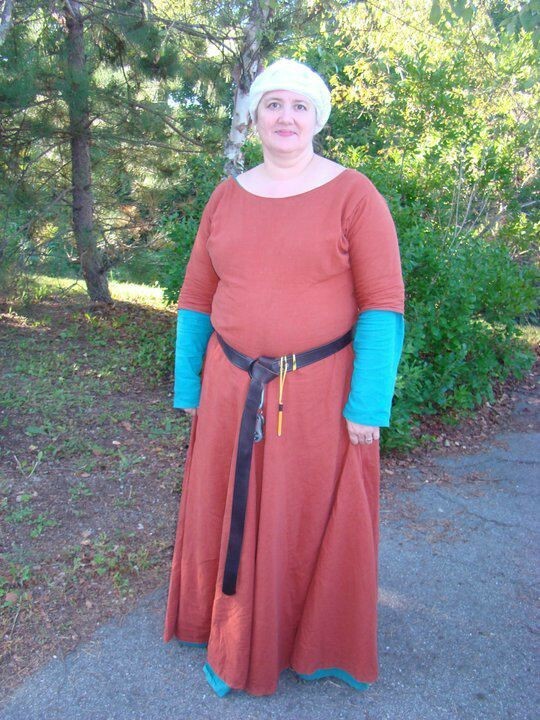 Also, very stylish for the medieval woman. I give credit to the photographer, Ed DuMont, who always seems to be able to make me look good when he takes my picture – one of the few that do! by the way, if you look closely at that picture you will see my car keys hanging from my belt buckle, along with a pencil on a ribbon. Neither one is what we, in the SCA, call “period”. But when you have no pockets, necessity dictates accommodation. Previous Previous post: Who am I and why am I here?